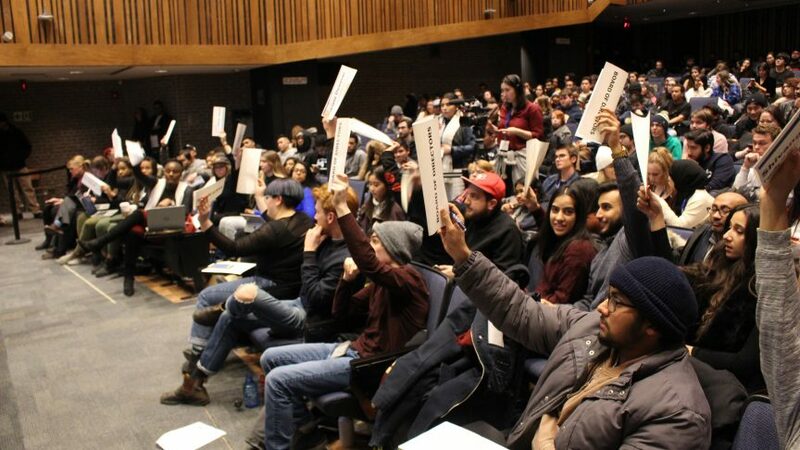 Motions to push back the 2019-20 Ryerson Students’ Union (RSU) elections passed at a Board of Directors (BoD) emergency meeting on Feb. 1, following allegations of the RSU misspending finances. The emergency board meeting was set for Feb. 1, because that was the deadline given for the executives to submit receipts for their credit card purchases. The Eye previously reported the RSU spent thousands on food, alcohol and other items, using students fees. At the emergency meeting, their financial controller Dharshini Jay confirmed that the total amount spent since the executive team came into office on May 1, up until Feb. 1, is $273,000. Their purchases totalling $250,000 were as of Jan. 7. At the meeting, other motions were also discussed and passed. The elections will now take place from March 12-14, with nominations remaining open from Feb. 1 until March 4. The election period was originally scheduled between Feb. 12-14, with the nomination period originally starting between Feb. 1-5. Present at the meeting were vice-president operations Savreen Gosal, vice-president student life and events Edmund Sofo and vice-president equity Karolina Surowiec. Vice-president education Salman Faruqi resigned Wednesday. President Ram Ganesh was not present based on the advice of his counsel out of concern for his safety, according to an email from his lawyer obtained by The Eye. During the next BoD meeting on Monday Feb. 4, a motion will be brought forward to remove all of the executives from office. A previous version of the agenda had a motion to impeach the executives during the emergency meeting. There will be a forensic audit conducted by PricewaterhouseCoopers (PWC) regarding the RSU’s finances, specifically the purchases made on the two executives’ credit cards, which were held by Ganesh and Gosal. According to Cristal Hines, a director from the faculty of community services, the audit would satisfy some of the students’ wishes that a criminal investigation takes place into the allegations of misspending by the union. A motion passed at the meeting, requiring Jay to present the RSU’s credit card statements to the BoD for Feb. 6. All three executives present—Gosal, Surowiec and Sofo—said they each have submitted their receipts to Jay. An amendment to the motion passed, stating that the BoD would be able to see the credit card statements or any other financial statement, without approval from the executives. According to Jay, the board will be able to see the spreadsheet of the purchases from the credit cards held by Ganesh and Gosal, which have not been reconciled. Effective Feb. 4, executive salaries will be lowered to $36,000. This is the amount they previously earned before the BoD voted to increase the executive team’s salaries by $11,000, for a total annual salary of $47,000, in May. 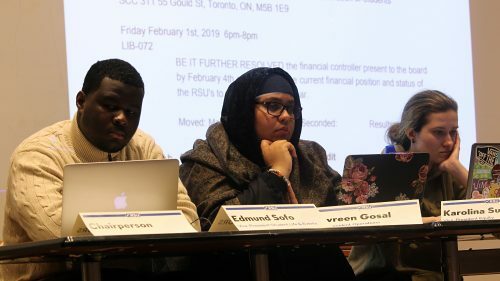 The motion to increase the salaries was put forward by a student named Tajinder Kaur, someone over 60 current and former BoD members previously told The Eye they didn’t know. The changes to the executives’ salary is a 30 per cent decrease according to the motion. The three executives present abstained from voting. A motion to abolish director slates and to make a recommendation to the Chief Returning Officer (CRO) to do so failed after several argument discussions from board members. It was argued by some board members that slates offer candidates and students a sense of community and support, while abolishing slates would make elections inaccessible to students. “We’re also abolishing accessibility…it wouldn’t allow students to [have resources],” said Hines. Faculty of Arts director James Fotak, who said he ran independently, struggled to finance and support himself without a slate to back him up. This motion stated that the RSU events committee, full-time events planner and board were not involved in planning Loud Fest, a Jan. 19 concert hosted by the RSU. Ganesh previously told The Eye that the concert was put on by Sesxions Entertainment. It called for a breakdown of concert expenses and revenues, as well as an overview of the free and VIP tickets that were given out. Jay said that the union was supposed to receive $300,000 in sponsorships to cover the event, but this was never obtained. The BoD previously voted to allot a budget of $470,000 for the concert, according to Jay. In an omnibus motion, the Poker Club, Italian Student Society and the Thaqalayn Muslim Association had their student group status renewed. The Ryerson Society for Technical Analysts and the Gujarati Association were newly ratified. This brings the total number of RSU student groups to 97, according to student groups coordinator Dawn Murray. A motion for the RSU to partake in Trans Awareness Month in November also passed. The month will include events and education programs. There will be a BoD meeting on Feb. 4, to put forward the motion to remove the executives from office. Feb. 6 is the date when directors can access the RSU’s reconciled credit card statements from Jay. These statements will be based on the line statements provided by the executives. They will not include the context that would be provided by a financial audit, according to Jay.